The Sydney University U23 men’s eight has just completed a three week development tour of Canada, The crew of first and second year students will have many candidates vying for selection in the SUBC Australian Boat Race crew who will clash with Melbourne University on Sydney Harbour on Sunday morning 26th October. 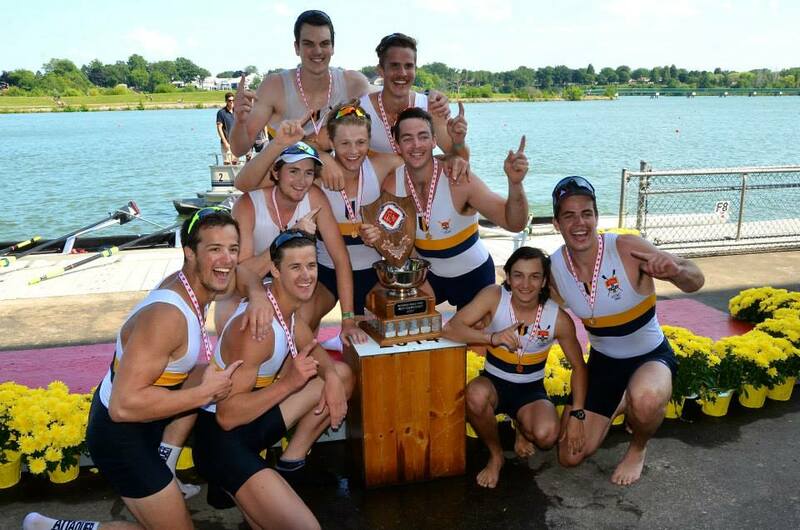 The crew’s main aim was to compete in the U23 and Championship eights at the Canadian Henley regatta. This regatta, held at St Catherine’s, Ontario is one of the largest in North America attracting several thousand competitors. Senior Coach Rick van Hooydonk led the team with assistant coach Tom Sacre and Captain Alex Purnell. The crew’s main objective was the U23 Eights and after flying to Toronto the team settled in for training at the London Training Centre ( a Canadian National Team centre) while staying at the University of Western Ontario. The warm up regatta was the Ontario state championships where due to illness our crew could only row an exhibition race. After two weeks in London the team moved to Ridley College at St Catherine’s for the Henley event. Being a young team the crew made steady progress throughout the 10 week training campaign. Coach van Hooydonk was forced to use some novel rigging to get the best out of a crew varying backgrounds and sizes. The crew raced in a double tandem rig. One thing learnt at the start of the racing was that we were no match for the local crews out of the start with our crew invariably falling behind early and through steady rhythm and power managing to move back into the field and into the leading group. In the U23 eights final our crew rowed well coming through the field but could not catch a well drilled Mendota crew who won with SUBC second. Team members Nik Belonogoff, James Davies, Jake Bicknell, Tom Whitehead, Dan Whitehead, Jack Cook, Campbell Watts and Alex Purnell will all be trying for selection in the Sydney Uni 2014 Boat Race crew. The attached photo shows our team with the Craig Swayze Trophy.